This article is about the enemy from Donkey Kong Country. For the similarly-named boss from Game Boy Advance remake of Donkey Kong Country 3, see Kroctopus. 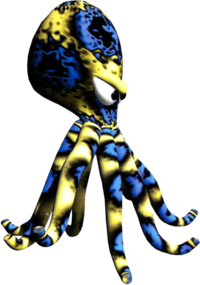 Croctopuses are octopus-like enemies found underwater in Donkey Kong Country. Their name is a portmanteau of crocodile and octopus. These creatures attack Donkey Kong and Diddy Kong by spinning their sharp, poisonous arms at any passersby. Their arms are even fatal to the Kongs' ally, Enguarde the Swordfish. They come in blue and purple colors. Purple Croctopuses move in fixed patterns around blocks of coral reef, while in the level "Croctopus Chase", several blue Croctopuses follow a set path, while the Kongs have to avoid them for a long stretch. Although Croctopuses do not appear in Donkey Kong Land, the game does feature a single stage which features several Nautili, which, according to the game's instruction manual, are called "Nemo". Several Croctopuses can also be seen in the Donkey Kong Country comic published in the Club Nintendo magazine; one of them attacks the Kongs and Enguarde. A Croctopus holds the letter "D" letter in Donkey Kong Country (GBC). The color scheme of a Croctopus is similar to that of the extremely poisonous blue-ringed octopus. ↑ Donkey Kong Country Nintendo Player's Guide, page 19. This page was last edited on August 5, 2018, at 12:04.